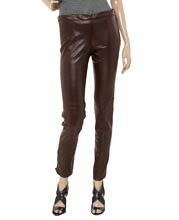 This leather pant is made from soft and pure lambskin leather. The plain and shiny surface makes for an elegant look. Your personality gets enhanced due to the smooth and skin fit throughout. The leather pant has a mid rise. It has zipped ankle which is partially lined. There is a feature of concealed button and zip closure at the side of this pant. This pant has an ankle stretch which makes you look smarter and taller. You can wear this in both formal and informal occasions.